Sathya Sai Baba (born Sathya Narayana Raju, 1926) is a popular Indian guru who has millions of followers and hundreds of Sathya Sai Centers in over a hundred countries. Satya Sai Baba was born to a poor agrarian family, as the son of Pedavenkappa Raju and Easwaramma. Being born after the Sri Sathyanarayana Puja, the child was aptly named after the puja’s presiding deity, Sathyanarayana. It was reported that when he was born, musical instruments in the household started creating playing music on their own. On May 23rd 1940, when he was fourteen, he claimed to be the reincarnation of the fakir Shirdi Sai Baba and subsequently took the fakir’s name. He says that he is an avatar (incarnation) of Shiva and Shakti and an embodiment of love with divine powers such as omniscience and omnipresence. 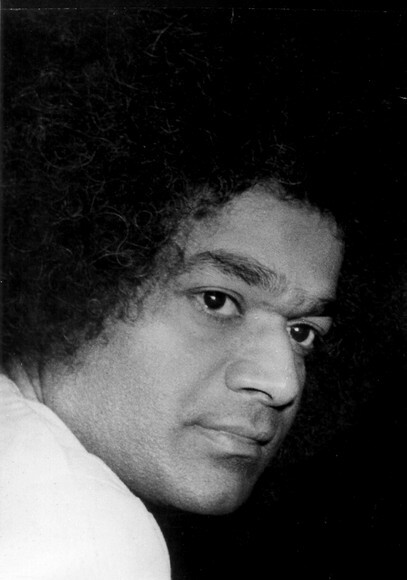 At the age of 14, Sathya Sai Baba declared to his parents that he had come to this world with a mission to re-establish the principle of Righteousness, to motivate love for God and service to fellow man. Since then, he has consistently called on all mankind to Love All, Serve All and has repeatedly asserted that the essence of all scriptures is Help Ever, Hurt Never! He has followers in over a 100 countries that are represented in world-wide conferences. His followers are estimated to be around 20 – 50 million. The once rural hamlet of Puttaparthi has been transformed into a thriving international city where thousands flock to see the Guru. It is said that the Sathya was a child prodigy, one who composed bhajans (devotional songs) spontaneously. The simple village folk marvelled at the child’s gifts, calling him Biddalaguru (child-guru) and Brahmajnani (knowing universal truths). There were other qualities too in the child that captivated people — his sunny temperament, generous and loving nature and kindness to creatures great and small. Even as a child Sathya was already manifesting extraordinary powers — plucking things out of the thin air, on one occasion even transfixing a scolding teacher to his chair! The smiling, frizzy-haired lad was half-prankster and half-conjurer in his schoolmates’ eyes. He was bright, showing flair not only for academics, but also music, dance and drama. Sathya Sai Baba urges mankind to: Believe in God –for there is only ONE GOD for all mankind, though He may be called by many names. Follow sincerely their own respective religions and live their daily lives in consonance with the teachings of good behavior and morality. Respect all other religions –for no religion advocates the negative and lower qualities of man. Perform selfless service to the poor, the sick, and the needy without thought of reward or fame. Cultivate in their lives the values of truth, divine love, right conduct, peace, and nonviolence and promote these values among all. Be patriotic and respect the laws of the country in which they live. He is said to manifest vibuthi (holy ash) and small objects like rings and watches daily. He claims to materialize these objects out of nothing. These claims are believed and testified to by his followers. Sacred ash, amrit (honey), kumkum, sandle paste, fragrances, flowers and even letters are reported as materializing from his pictures all around the world. In addition, the followers, and even many non-followers, have testified about many miracles and cures performed by him. He preaches a foundation of five basic values: Truth (Sathya), Right Conduct (Dharma), Peace (Shanti), Love (Prema) and Non-violence (Ahimsa). He teaches the unity of all major world religions and says that they all lead to God. His followers and the organizations that he has founded are involved in many charity projects, providing free modern hospitals and water projects serving thousands in the Indian state of Andhra Pradesh and the city of Chennai (Madras). In his ashram and around it there are various buildings including a University and a World Religions Museum. He has founded schools all over India and his “values-teaching methods” are slowly being implemented in other countries.